Scandal photos of Prince Harry, the 27-year-old son of Prince Charles and the late Princess Diana, and younger brother of Prince William, have leaked online. 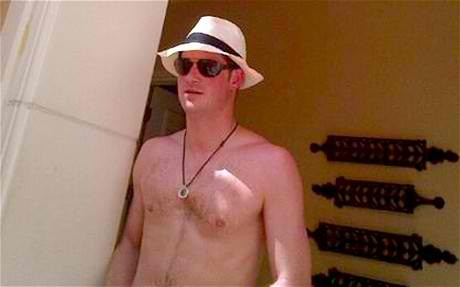 Entertainment website TMZ has at least two (2) scandal photos of Prince Harry while partying naked in Las Vegas. According to the site's report first posted on Tuesday, August 21, 2012, Prince Harry's naked Vegas photos were taken last Friday, August 17, during a "strip billiards" party at a private suite of Wynn Hotel Las Vegas. Prince Harry was reportedly with two male friends, and they invited some girls to come over with them. One of the leaked pictures shows Prince Harry in front view (but he's covering his private parts with his hands), while the other one shows him in back view, totally bare. He's with also naked woman in both pics. It's unknown who really leaked Prince Harry's scandal photos in Vegas to TMZ website but it's most likely that she's one of the girls who were invited at the party. Or it could be one of his "traitor" friends. The Royal Palace has already confirmed that Prince Harry is indeed the guy in the scandal photos, and made a desperate move of preventing British newspapers and TV reports to publish or show the said Vegas pictures. There's actually no big deal in it 'coz it happened at a private place. Prince Harry was just having fun, enjoying his life just like any other ordinary people. However, he needs to be extra careful in what he does and with the people he's going out with. He's a PRINCE and he obviously couldn't get away with it.